Nanosolar, the private company that intends to manufacture the world's most cost-efficient solar cells using nanotech innovation, produced and released its first printed thin-film solar panels just last week. Then they put Panel #2 from their production up for auction on eBay. Bidding quickly rocketed from 99 cents to US$13,000 and Nanosolar decided to use the proceeds for a charitable purchase. 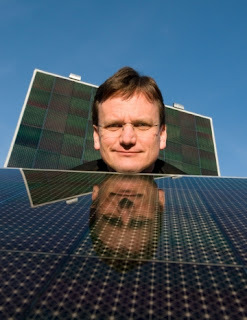 But as Nanosolar CEO Martin Roscheisen (pictured, and you gotta love that picture) notes on the company blog, "without warning eBay today decided to delete our auction due to the promised charitable use of the proceeds." Nanosolar's legal team tried to get eBay to reinstate the auction, but to no avail. "Upon review," Roscheisen writes,"we decided this isn’t a battle we care to fight more than an afternoon, so it’s back to building cells and panels for us." For now, Panel #2 will stay at Nanosolar. Unfortunate and shortsighted on the part of eBay. Kudos to Roscheisen and Nanosolar for wanting to do something more than just take the money and run. Our only outstanding question is: when is the IPO?